This is the Single-Modem version of the renowned FoxBox GT2! If you need a greater incoming/outgoing transmission rate, please consider the GT2 machine (double modem). A general purpose Linux server similar to the SMS/MMS version of the LX800 family, but really more powerful and with triple LAN Ethernet port. It provides advanced SMS (and optionally MMS) messaging services (either stand-alone or integrated with other applications), SMS/MMS to EMAIL or TCP/IP gateway features, monitoring solutions and much more (include custom developments, aided by our Support Team). This is the flagship product of FoxBox GT family, in the single-modem version. Here you can find (directly or installing plugins) all the features provided by other versions. Explore all the FoxBox GT2-S capabilities on our FoxBox Documentation Wiki. Do you need to increase your communication potential? Combining FoxBox GT2-S with FoxBox Rack will allow you to send massive flows of SMS, MMS or DATA in the easiest way ever! Noisless, thanks to its passive cooling system (from the CPU to the enclosure using a 3 mm alu heat spreader). Gateway FoxBox GT2-S is a compact and low cost hardware gateway to send and receive SMS or MMS (reception only) messages using a commercial SIM card. Once put in your IT infrastructure with a small effort, it acts as a web server with a fully featured web interface to manage its messaging capabilities. More generally, this device is perfectly suitable for every application that requires a fast and safe message flow management, in both the directions (incoming or outgoing). System logs and DBMS interface. Collection of graphical contents with MMS management. Needing of forward emails to a mobile phone via SMS to reach remote operators (maybe following some particular logic). Devices management through a common SIM card. 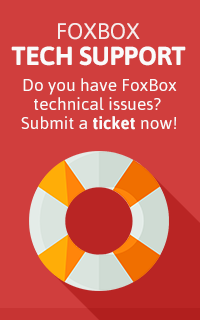 Do you have technical problems with your FoxBox? Please open a ticket trough our Support Center!